This time last year it was mere days before Cam Russell pulled off a blockbuster trade to land the second overall pick at the 2016 QMJHL Entry Draft which resulted in Jared McIsaac becoming a member of the Mooseheads. One year later, he is the best 16-year-old defenceman to ever pull on a Halifax uniform. 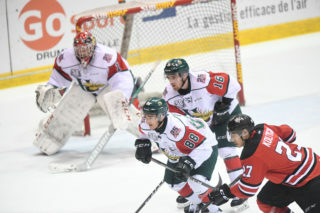 McIsaac finished his first year with the Mooseheads as the highest scoring rookie blueliner for his age in franchise history, scoring four goals and 28 assists. He proved to be a force on the power play with 19 points coming with the man advantage. His 32 points placed him second to only MacKenzie Weegar’s 44 points that he posted as a rookie. Of course Weegar was an 18-year-old rookie in 2012-13 when he accomplished that feat. McIsaac is quite simply in a league of his own when it comes to home-grown talent drafted and developed by the Mooseheads. McIsaac steadily developed at both ends of the ice and found himself on the top pairing on a nightly basis. He learned to handle pressure situations with the ease and patience of a veteran. “Obviously I want to improve in every way possible but it’s one step at a time,” he said. “Jared is now and will be an important part of our team for years to come if we are to be successful. He has a low boiling point meaning he does not panic under pressure. He sees the ice extremely well and passes the puck with excellent accuracy,” said General Manager Cam Russell. The former Cole Harbour Wolfpack player had plenty of pressure on his young shoulders when the season began for the Herd. McIsaac made headlines throughout the summer after being selected by his hometown team second overall in the QMJHL Draft and with headlines come expectations, big expectations. Especially since the Mooseheads gave up three picks in the first round along with a second round pick to get him but it’s safe to say he’s handled it all as well as possible. Reliable QMJHL defencemen at his age are hard to come by no matter how high they are drafted. It’s simply a position that takes more time to develop than most. McIsaac has shown that he can be counted on to face the opponent’s top forwards as he maintained a +7 rating throughout the course of the season. The combination of skating ability and size has led to his success on the ice. McIsaac is listed at 6-foot-1 and 190 pounds and has proven to be a mobile defenceman that’s able to drive the play offensively while remaining responsible on the defensive end. There really is not anyone to compare him to from the Mooseheads but one can see some similarities to Bedford native Luke Green who was selected first overall by the Saint John Sea Dogs in 2014. Green had 36 points as a rookie and is of similar size and mobility although McIsaac is a little more apt to get involved physically. “He takes fewer chances with the puck than he did at the beginning of the season. For a while he tried to force plays that might not have been there. I find now he makes better choices with the puck and has improved his physical game as well,” said Russell. McIsaac might have been a newcomer at the start of the season but he had plenty of familiar faces around him when he arrived at training camp last August. Fellow 16-year-old rookies Benoit-Olivier Groulx and Alex Gravel suited up with McIsaac for Hockey Canada at the Youth Olympics in Lillehammer, Norway last winter where the trio became close friends. There’s no question that support and friendship has helped ease his comfort level as he transitioned into the league. Reflecting on the past several months of his life, he explained that he’s thankful every time he has the opportunity to skate out onto the Scotiabank Centre ice. The Truro, NS native has gradually grown accustomed to the speed of the play in the QMJHL and credits his ability to adjust to some of the veteran players, including defensive partner Frederic Aube who finished up his Junior career with the Herd. Aube was acquired from Drummondville during the mid-season trading period and was nothing short of impressed by his young teammate. The veteran Aube went on to rave about McIsaac’s intelligence with and without the puck and said there is very little advice he could offer to his young partner. Frederic certainly isn’t the only big fan of McIsaac. We’re all thrilled to have a front row seat to watch the development of this young Mooseheads star over the next few seasons. It’s going to be a fun show.